Bank balances from both the operating and reserve accounts. How many units in your association? 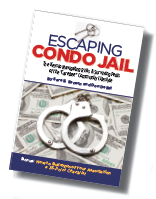 Escaping Condo Jail is now available for sale on Amazon.com where you can read reviews of the book and even take a look inside. "This epic tome can save you thousands of dollars and free you from the angst of being trapped in a condominium ..."
Go into a condo purchase with eyes wide open!